As the Best Wedding Photographer in CT I know that the Candlelight Farms Inn is a prime location for a lovely country wedding. The Candlelight Farms Inn is located on Candlewood Mountain in Milford, Connecticut. The inn was established in 1843 and has been welcoming guests into its cozy, yet chic interior ever since. The property of the Candlelight Farms Inn is perfect for a charmingly rustic wedding, with breathtaking views of the Connecticut scenery. Only the Best Wedding Photographer in CT would know to capture images of the beautiful scenery and images of the details that make a wedding day a truly magical experience. This picture showcases the bride’s gown before she puts it on for the marriage ceremony. The dress hangs in the window of a room at the inn. Off-camera, the bride and her maids are being made ready for the day. The ladies are getting their hair done up and makeup put on, while they chat and laugh throughout the morning. The dress waits patiently in the corner, away from the movement and noise, for the bride to walk over and put it on. The gown is pure white, and made of chiffon. The waist of the gown is adorned with white roses -- flowers that match the bouquet she will hold as she walks down the aisle. 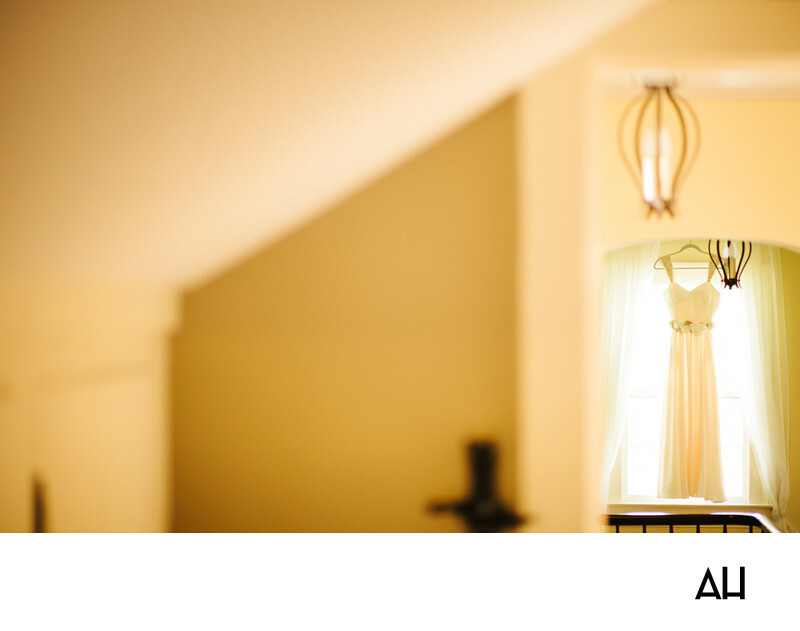 Sunlight shines through the long window, filtering through the sheer curtains and the gown. The light washes the room in a warm glow, making it seem almost ethereal. Soon, the bride with done the heavenly dress, transforming herself into a fairy princess who will then fly off to meet her prince.